Our Economy package is ideal for the new business start up service. 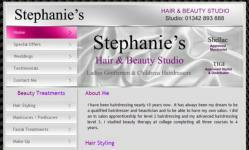 Aimed at keeping costs down this service allows for your website to develop as your business grows. The example to the left is typical of a new start business. Beginning with a 3 page site extra pages were added as the business expanded. Using our Content Management System this client is able to keep her website up to date with the latest changes and promotions.